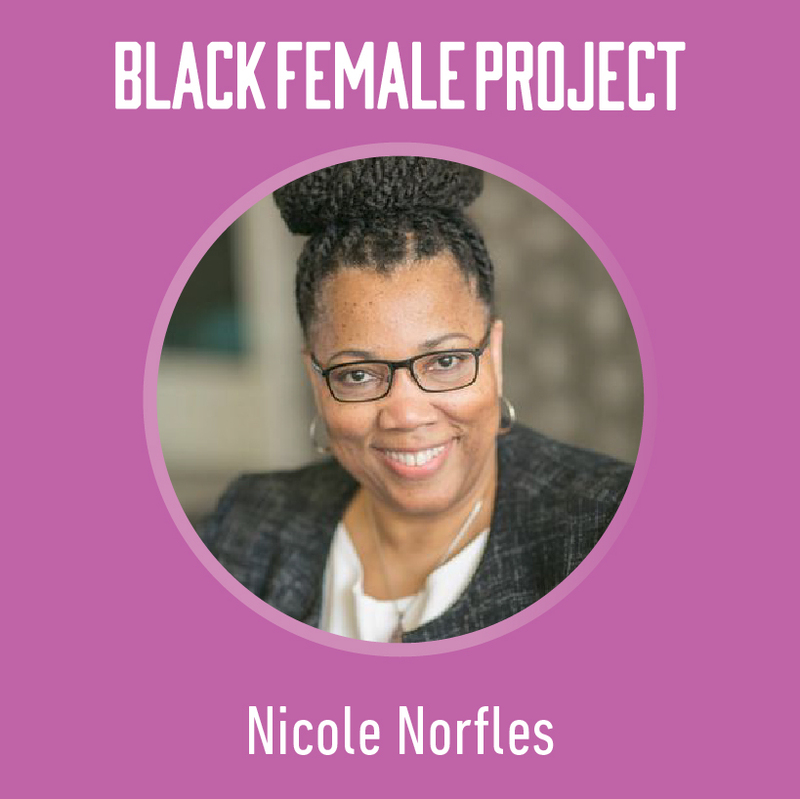 In sharing why BlackFemaleProject matters to her, Nicole sheds light on the power and importance of storytelling, able to heal the storyteller, educate the listener, and heal the collective. “In its recounting through story the continued depths of racism and prejudice that Black women experience, as well as the model of strength Black women exhibit to continue to work productively in negative environments,” she says, “BlackFemaleProject reaffirms my personal sense of self-confidence.” We are humbled to be able to restore such integral and valuable feelings in brilliant Black women like Nicole. We hope you’ll join us on our journey as we change the world, one story and one conversation at a time. Dr. Nicole Norfles facilitates Council for Opportunity in Education’s (COE) STEM Community of Practice; is co-Principal Investigator on multiple National Science Foundation grants; directs and coordinates multiple U.S. Department of Education grants; and directs COE’s Onboarding Professional Development and TRIO Chicago Collaborative. She previously served as Education Program Officer with the Oprah Winfrey Foundation; Policy Consultant with Casey Family Programs; Special Assistant to the founding President of COE; and Fellow at the Pell Institute. She co-taught a Michigan State University South Africa study abroad course; a Drexel University online leadership course; and George Washington University courses in educational foundations, leadership, and supervision. Dr. Norfles presents at numerous national and international conferences, and serves on multiple boards; she received her doctorate from The George Washington University. When April Fenall first crossed paths with BlackFemaleProject Founder Precious J. Stroud, she was a business owner in the process of learning how to tell her own story in a compelling way; connecting to our storytelling project was timely and serendipitous. “I was excited to be a part of a project that focused on empowering and creating a space for Black women to have a voice,” April shares. April is a survivor. A Bay Area native, mother, stepmother, and entrepreneur, April has persisted through significant barriers, missteps she’s made in her past, and trauma inflicted on her at the hands of others. She has overcome experiences with sexual abuse and domestic violence, substance abuse, and incarceration, and navigates life with a disability. Like all of our BlackFemaleProject contributors, April refuses to be defined by her circumstances and challenges. “I am living my best life and empowering those that are ready to change their narrative,” she says. By extracting the wisdom available from her journey and focusing on possibilities, April is thriving on the entrepreneurial path she has forged for herself. Her connection to BlackFemaleProject—as a participant and inaugural leadership team member—has played a major role in getting her to this point. The connection has been fruitful in a technical sense, as April says that working on the Project and watching its growth over the years “has provided a great template to follow in growing [her] own businesses and social media presence.” Since her first exposure to BlackFemaleProject, she has transformed what was once an idea into a thriving and successful business: PiikUp is an innovative and socially responsible delivery hub for businesses, employing and supporting people who face barriers to employment. Beyond the technical, though, the women who make BlackFemaleProject what it is have provided April with invaluable interpersonal benefits that can only come about through the support of powerful community. She says she’s gained “a sense of belonging to a special group of women who are fighters and have found their voice,” remedying feelings of isolation, and points out that it was a fellow BlackFemaleProject sister who talked her through her plans to confront her mother’s abuser, a loaded and life-changing step to take. The relationships April’s developed through our community have been, in her words, “inspiring, supporting, and caring.” What’s more, this sense of support that April has received has come in different forms, not just from in-person relationship building. She speaks to the benefits she’s gained from listening to our podcasts and reading written content as well, pointing to several specific pieces in which she’s found reflection and affirmation. We are so happy to be able to lift up the remarkable stories of our sisters and that the various formats we offer can have this level of impact within our immediate community and beyond. These things and more encouraged April to join the #100SistersStrong movement by supporting the Project through membership. If you haven’t already, we hope you’ll consider doing the same! Connect with April on LinkedIn.